In the land of golfing superheroes, Tiger Woods’ win at the Masters 2019 was "our biggest golf loss ever" according to William Hill U.S., which lost "seven figures." FanDuel lost $2M, while The Westgate Las Vegas SuperBook lost nearly $100,000. Some sports books did better with MGM Resorts International claiming it broke even while delivering its "biggest handle ever," according to this Bloomberg article. The importance of running an intelligent sports book was highlighted by the actions of DraftKings. 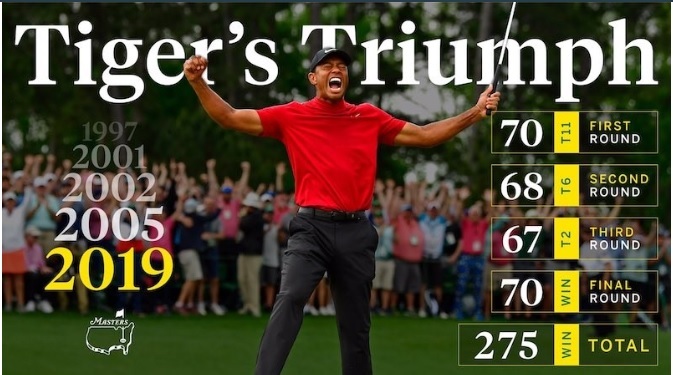 As commented on in this article from the South China Morning Post, DraftKings increased Tiger's odds on Saturday from 7-2 to 10-1 when pro-Woods wagers made up 60% of the bets on the site. DraftKings increased Tiger's odds again on Sunday, the final day of the Masters, to 15-1. Compare that to William Hill U.S.'s odds, which were 14-1 on the Tuesday before the Masters started. That's when a bet was placed that won $1.2M, as The Washington Post article highlights. The fact DraftKings increased Tiger's odds on the Sunday after Woods delivered 60% of the website's betting action on the Saturday tells me this was actually a customer acquisition 'play' by DraftKings. Why would DraftKings make such a 'play' on Masters Sunday? For those who are regular viewers of the last day of the Masters, we know it is the single most unpredictable day of 'golf for superheroes' worldwide. Anything and everything can happen on the back 9 at Augusta on Sunday. Without fail, year after year and decade after decade, anything and everything does happen...sometimes triggering feelings of awkward embarrassment as an unassailable lead is thrown away, other times triggering feelings of jaw-dropping incredulity as shots are made and scores carded that win Majors...and sometimes awkward embarrassment and jaw-dropping incredulity simultaneously. As to major winners, if you read our Casino Life summary of a Morgan Stanley research report about its recent US Sports Betting Field Trip, you will learn (hopefully) some insight to my question above...and why I believe DraftKings' action of increasing its odds on Tiger Woods on both Saturday and Sunday was a customer acquisition 'play'. That against the Morgan Stanley belief that U.S. sports betting will be more online than onground given New Jersey's sports betting handle was 80% online in February 2019. © 2019 Damien Connelly All Rights Reserved.